Recently, I kept seeing pictures all over Instagram for this stunning chocolate chip cookie and thought, I gotta try making those. (Can a cookie be stunning? I never use that word but I find it very fitting for this occasion). When the recipe popped up in the NY Times a few weeks ago, I knew it was finally time to try them out. 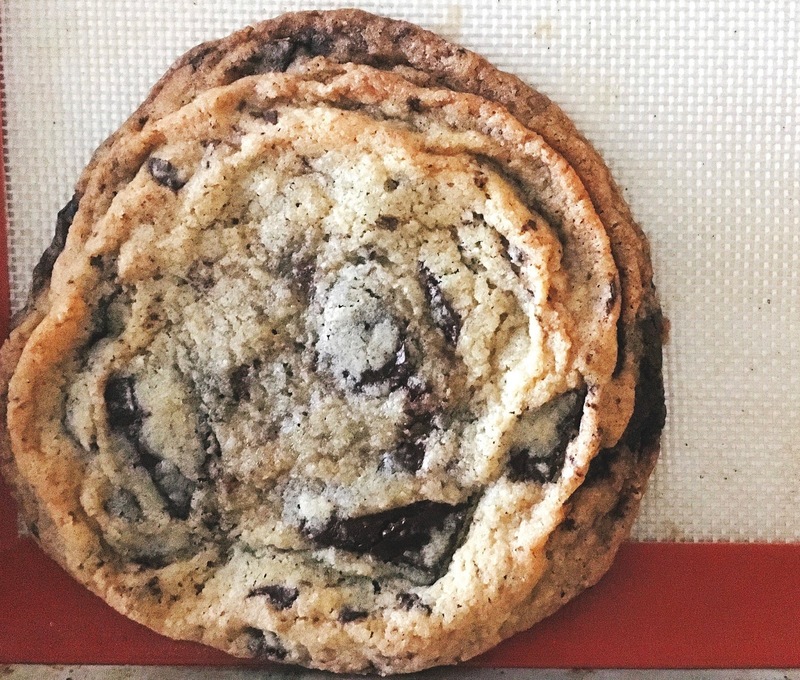 Just by looks, the cookie appears to have the perfect combination of crispy edges and a gooey center because of the beautiful crinkles or ripples on the edge of the cookie. This is achieved by simply banging the cookie sheet on the oven rack while the cookie is baking. 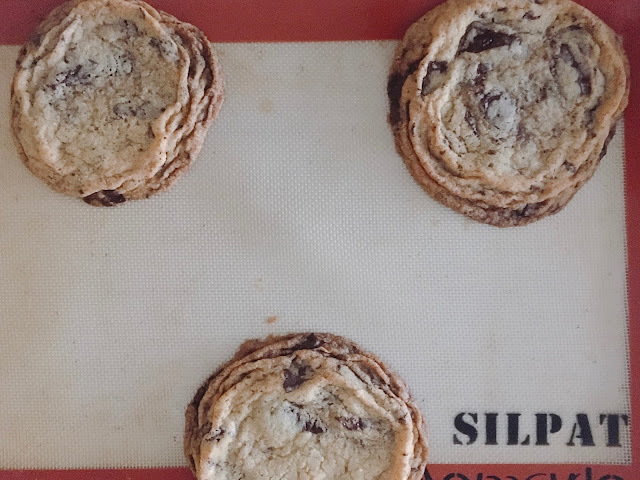 To be honest, I was a little intimidated by the "banging the pan on the oven rack" step--not sure why but I was concerned my cookies wouldn't turn out as perfectly rippled. But take it from me, these cookies are pretty easy to make. They just take a little extra time waiting for butter to soften, freezer time for after the dough is formed and then extra baking after banging the pan. And are they as delicious as they look? I'm going to say almost. I overbaked my first batch so the cookie middles were crunchy (I'm not a fan of crunchy cookies). Then with some time adjustments, the middles were softer but thin from all the banging. Maybe I just love soft, pillowy cookies and these cookies weren't quite that. But don't get me wrong, these cookies taste freaking good, texture aside. I used 70% dark chocolate since a reviewer complained that they were too sweet. And these cookies are a great way to impress friends with your baking skills. The Recipe: Sarah Kieffer's Giant Crinkled Chocolate Chip Cookies featured in the NY Times. 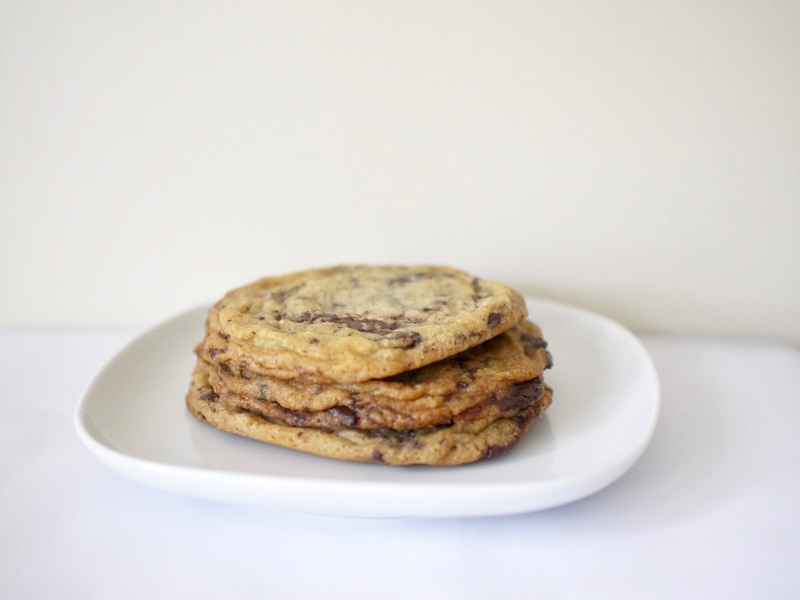 Warning: these are huge cookies and if you're brave enough to look at the nutrition facts that the NY Times so graciously put up on their site, maybe just have one cookie over a stretch of a few days. spread out the cookies on the baking sheet--these spread! I had better luck after the initial 10 minute bake by banging the pan and baking for 3 minutes, then banging the pan again and baking for another 3 minutes (so two-3 minute baking sessions after banging the pan). My first attempt, I did a longer bake and hence the crunchy cookies.